At about 2p.m. Last Friday, my day off, I found myself at the Costco doing some shopping. Standing in the check-out line I decided I better get a slice of pizza (a tragic moment of weakness), it had been a couple of weeks since I had last had pizza and I wasn't expecting to get any until my holiday in late February (little did I know). So I got a slice of combo and a soda, it cost $2 and some change. The combo has pepperoni, sausage, red onions, green peppers and black olives. I'm not big in green peppers but they were pretty much on top of everything and easy to pull off. So was it worth $2 and change? 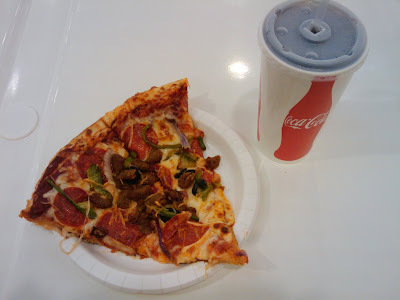 Just, see my previous review for more on my thoughts of Costco Food Court Pizza. If I get pizza at Costco at some point in the future I will probably stick to a pepperoni slice. On another note, the exit employee (the person who checks your receipt as you leave) said that you didn't need a Costco card to eat at the food court. If your jones'n for a Costco pizza slice and you don't have a membership I recommend you call ahead so as to avoid disappointment. My mother happens to be a fan of Costco pizza. Now that somebody else besides her endorses it, perhaps I'll give it a spin. By the way, I'm curious as to why you won't get pizza until a holiday in late February?